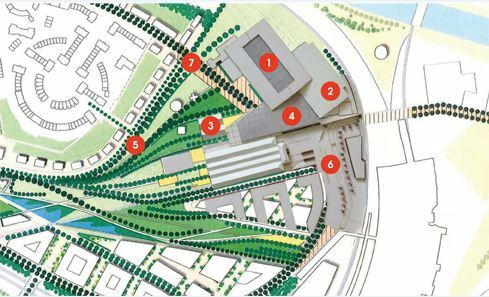 When I arrived at the National Railway Museum at the end of 2012, my colleagues were still a little bruised from the recent collapse of plans to develop the land behind York Station. Along with many others in York, we had put a lot of time and effort into getting the huge swathe of brown field land around the museum into more productive use. There was an air of frustrated resignation about York Central’s missed opportunities. I came to the museum and York as an outsider, and from London where I’ll now admit big investment happens a bit more easily. It seemed incredible to me that nothing was happening. One of the country’s best known interchange stations, with 1 hour 50 trains to London, was not meant to border a huge zone of surface car parking, warehouses, car washes and disused railway sidings. It is testament to the fundamental strength of the museum that 750,000 people a year come for a day out in such an unpromising location. 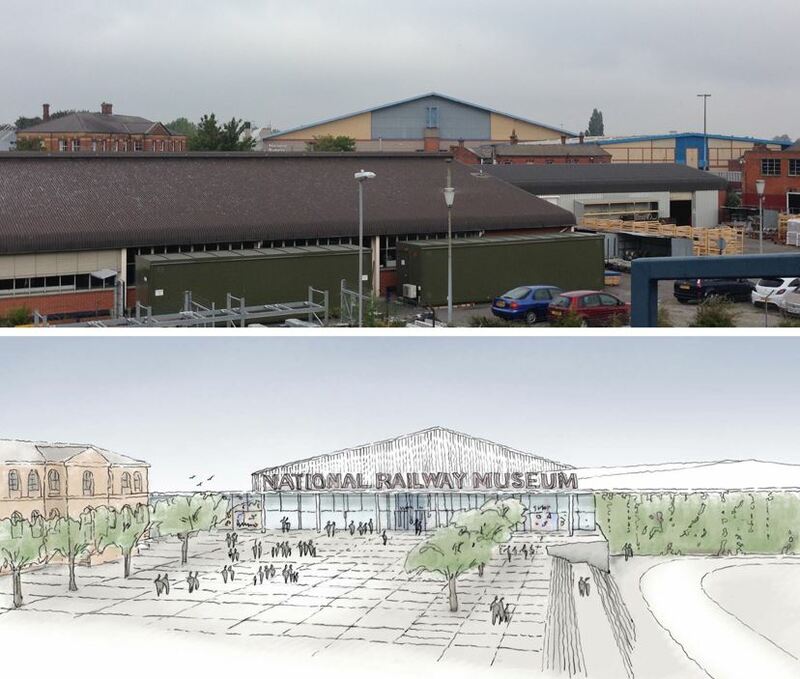 The current view of the National Railway Museum as from the walkway from the Station (above) and the type of space York Central can help make happen (below). We started thinking about what we needed to do to realise the potential of world’s greatest historic railway collection and it became clear to me that there were three problems York Central could solve for us. It allows us to make the building work for visitors. At the moment, it’s hard even to find the museum entrance and once inside, the museum is split in two by a road. I’ve met visitors who didn’t realise the other half of the museum even existed. Clearly, starting from scratch, no-one would have designed a museum like that. By moving Leeman Road, we can build an inspiring and welcoming entrance, that links together all of the museum, so people can find their way around without struggling with underpasses and things hidden from view. We’ve already planned specific project to upgrade the museum – find our more about these seven areas. It will put us in the City Centre. York is a great place to have a museum. There are 7 million tourist visits a year, but they only come to the National Railway Museum if they have made a very specific visit. Instead of being at the centre of the action, we are literally the wrong side of the tracks. York Central will make the museum the cultural heart of a new city centre district for York, and our surroundings will be the kind of streets, squares and parks people want to linger in – and then visit the museum as well. It’s bold enough to happen. Lots of the things we want to do at the Museum don’t need York Central. But the development is already getting national and international attention. It can be a catalyst. When all our small and medium sized plans are part of a bigger vision for the museum, and for York, they are much more likely to happen. So you can guess what I’ll be saying to the City of York Council’s consultation! Have your say too. Re-routing Leeman road offers a rare opportunity to make the use of available space.